We returned to the docks on Wednesday, 16 January, 2008. We were scheduled for an inspection meeting involving three of the parties that operate on the docks: MARVAL, the overall operating company; TPS, the German company that operates the portion of the docks that our ship came into; and San Francisco, the subcontractor to TPS that unloads the ships. 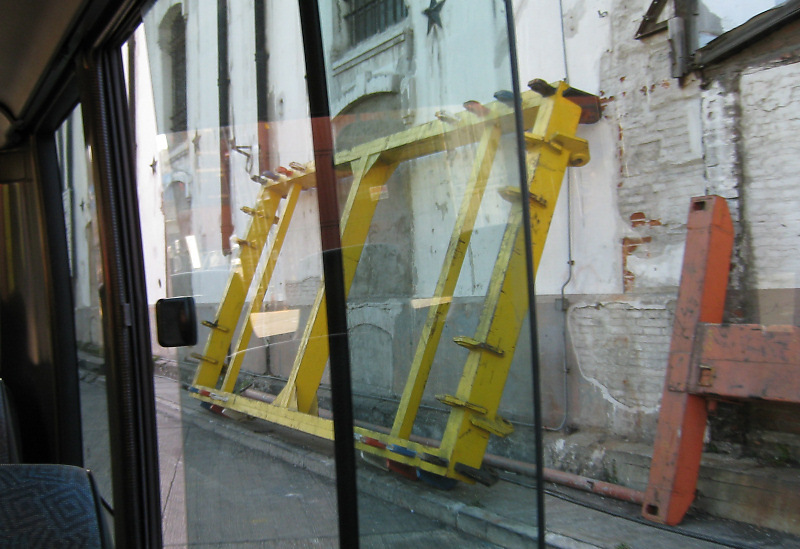 On the bus ride back to the meeting I spotted the lift frame that should have been used to lift out our rig. It is stored about 150 feet from where the crew unloaded our rig. 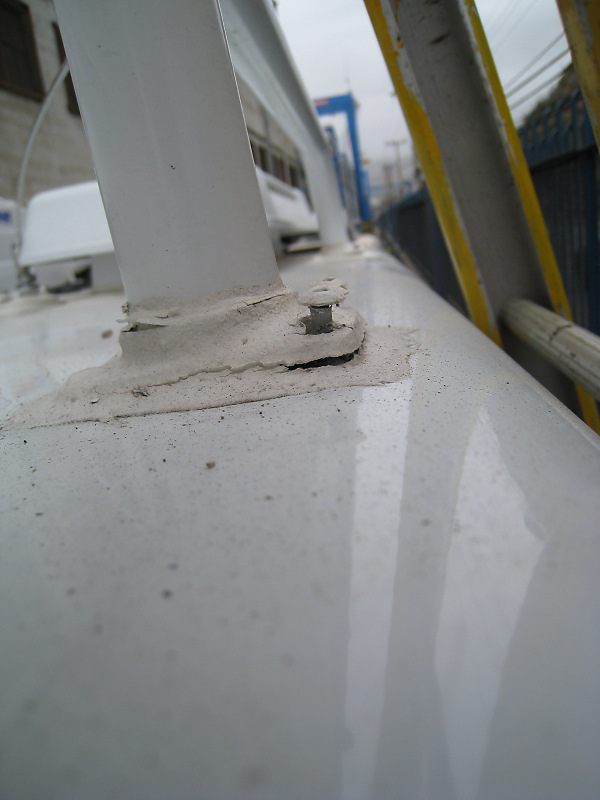 My task was to uncover the rig so we could inspect the camper shell to see if it was compromised, i.e. 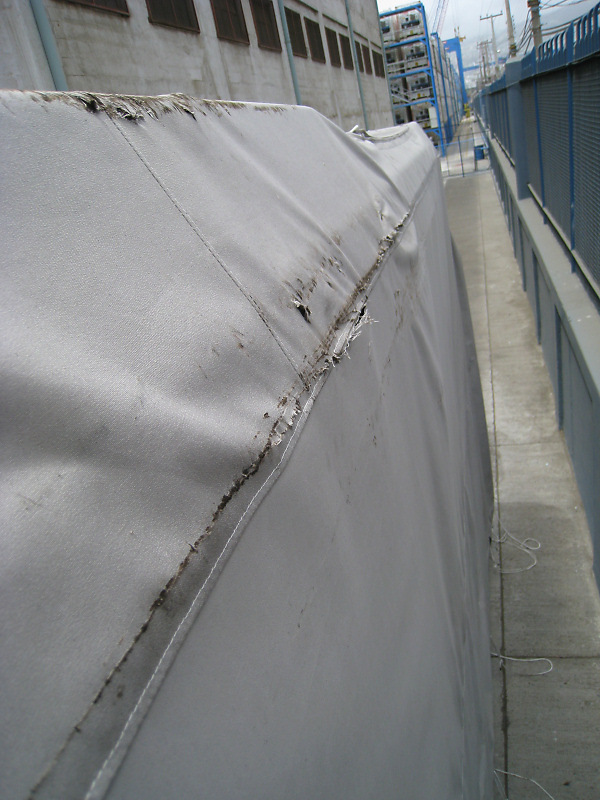 destroyed, by the improper equipment used to lift our rig off the ship. Top corner of camper that was pinched in by the lift cables. 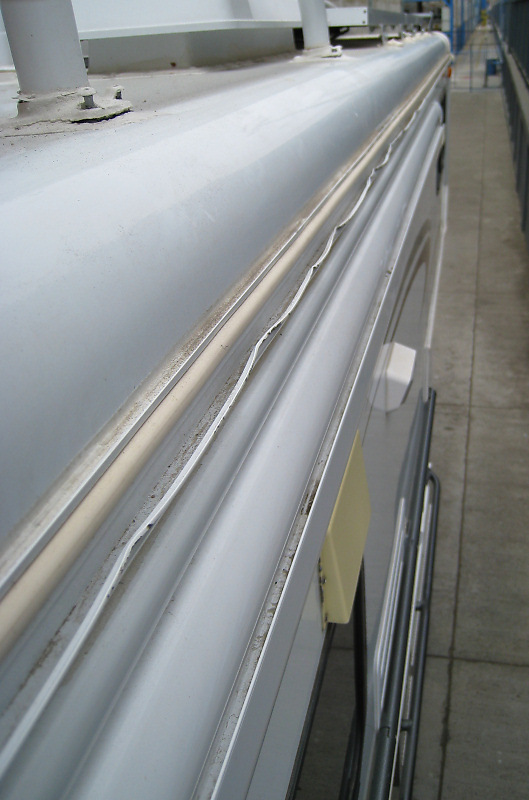 Drip rail / rain gutter bent in by lift cables. 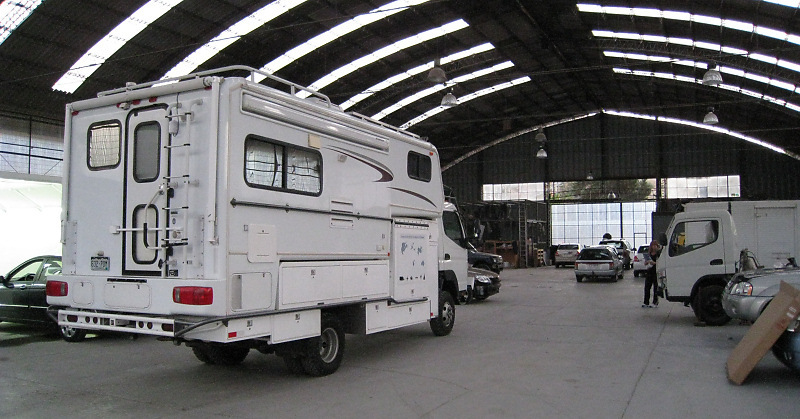 Camper top cargo rail de-bedded by lift cables. 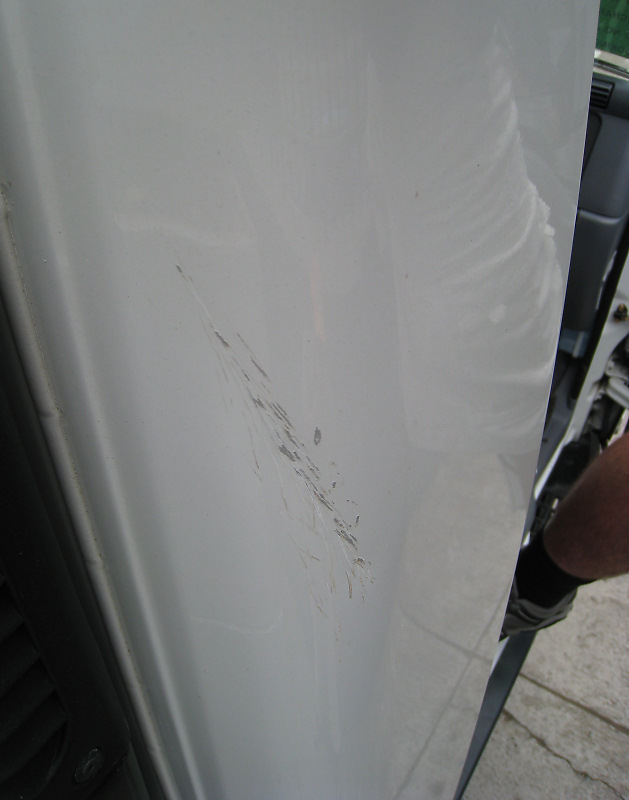 Dent and scratches on cab from lift cables. I could not find any cracking or crushing of the camper. Until I get a hose and some water on it I will not know if it is leaking. My conclusion is that Bigfoot builds very strong 3000 series products. I think an aluminum camper shell would have folded up like a beer can if exposed to the crushing forces of four lift cables holding the weight on our rear axle. TPS signed off on a document detailing the damage and accepted responsibility for same. If we are lucky, we may be compensated within a few years. After waiting for the paperwork to be processed, we were finally released from receiving storage. All four us us (Steph, Jorge, Mario and myself) climbed into the Fuso cab. We then ran the gauntlet of the docks. Next stop was customs, where the inspector needed to verify our three VIN numbers (Fuso & two bikes) and issue us our temporary importation documents. She wondered at the sacrifice we were making by traveling for three years. That’s the first time we’ve heard it referred to as a sacrifice. The last hurdle was the exit gate. They were taping a scene from a Chilean soap opera just outside the gate. I thought that was fitting, considering what we’d been through the previous week. It had been, in some respects, a real soap opera. And here the Fuso would be in the background, an extra, in a real local soap. The gate inspector came out and eyeballed the two bikes in the garage, and finally we were through, released into freedom. At approximately 9PM / 21:00 we rolled through the exit gates of the Valparaiso docks. 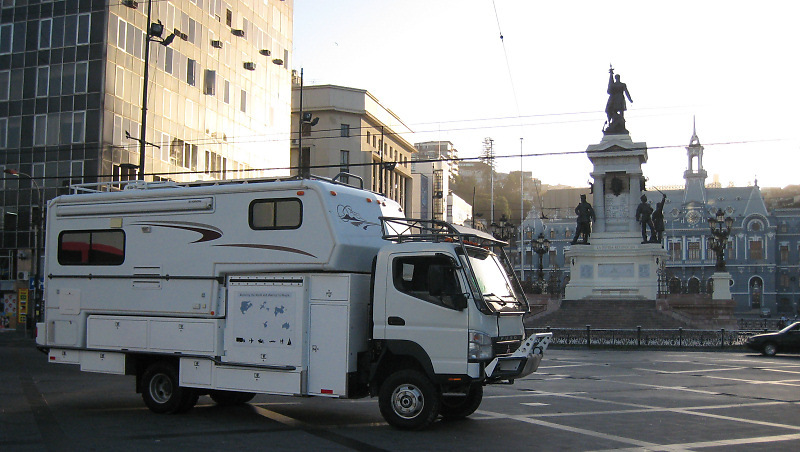 Our first stop was the plaza in front of the Chilean Navy building & monument. Our next stop was the local Fuso body shop, where the door will be repaired. We pulled in about 9:45PM. The manager had stayed and waited for us. Had that level of service in the U.S. lately? Sorry to read about the damages to your rig and the the “sacrifice” the you are going through. After the pain has passed and the bones heal, this will be another campfire story. Eyes will still focus on the “Bling”. The shop isn’t the same without Doug, Steph and Fuso. Doug, Must have been a tremendous letdown after all the buildup..Glad it seems to be reparable and covered.. I was curious if you saw any vehicles being off loaded with lifting rings/shackles ala military vehicles? Nothing but good luck for the trip to come..We all enjoy reading your blog/journals…What a great adventure..! Doug/Stephanie, thanks for the update and glad to know it hasn’t derailed your South American journey or spirit. The pics reminded me of our recent visit to Valpariso (just wish we would of known about J. Cruz’s while visitng). I’ve shared your story with Michael and Carolyn, too. Safe travels! Hey Doug! Isn’t overcoming obstacles what it is all about? This is probably the first of many for you and Steph…and you will have the time of your life doing it. Thanks for the updates…I read them all and appreciate you sharing your life’s journeys.